Have you ever been curious about what we do or what we have at Rare Books and Special Collections at UBC Library (RBSC)? 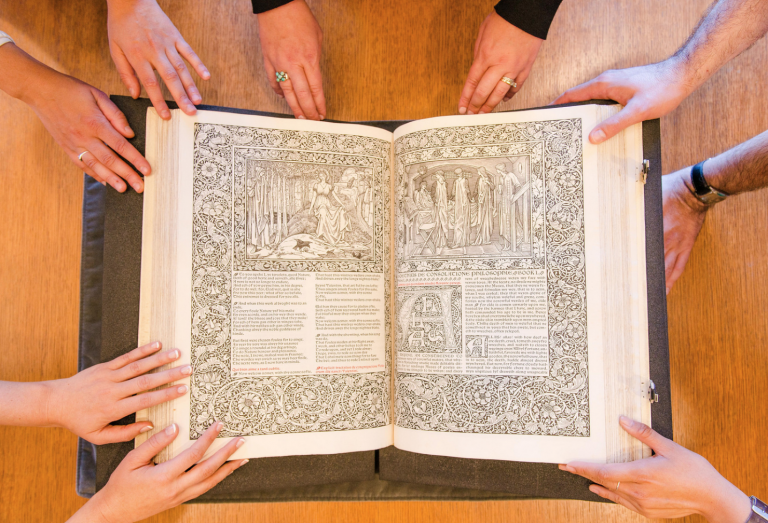 Interested in seeing the famous Kelmscott Chaucer in the flesh or a medieval bible from the 13th Century? Join our weekly open house/hands-on show-and-tell for an introduction to our space and our unique materials and collections every Wednesday at 11:00 am. The event is free and open to the general public, as well as the UBC community. No need to RSVP, just drop in to learn what RBSC is all about. Rare Books and Special Collections is located on the 1st floor of the Irving K. Barber Learning Centre, 1961 East Mall, UBC Vancouver campus. For more information or to book visits for classes or large groups, please contact Rare Books and Special Collections at (604) 822-0645 or rare.books@ubc.ca. All classes should be booked at least a week in advance. No pack sacks, overcoats, food, drink, or pens are allowed in the seminar room. Lockers are provided.